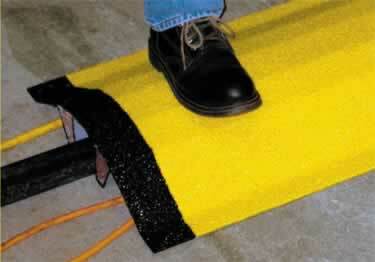 Cable and Pipe Covers provide anti-slip cable protection to any workplace. These covers are specifically engineered with a non-slip surface and can support foot traffic over exposed wires, pipes, conduit and cables. The covers act as a bridge, effectively concealing the utilities and pipework underneath while ensuring safe traction on the surface. I will be using this on an outdoor application. Will the fiberglass hold up? I have a steel brace on the floor of our facility that I need to bridge for foot traffic. The brace has a height of 1 1/2" and a width of 5" and a length of 4'. I am really interested in your product but do you offer it in a height smaller than 3"
Cable and Pipe Covers provide anti-slip cable protection to any workplace. These covers are specifically engineered for providing a non-slip surface for foot traffic over exposed wires, pipes, conduit and cables. The covers act as a bridge, effectively concealing the utilities and pipework underneath while ensuring safe traction on the surface. Our electrician quoted us to take the conduit from across the floor and bring it overhead. I asked a safety consultant if this would be an acceptable alternative? He said yes, I purchased 2 panels and they are sturdy, with non-slip material and solid. Great price in comparison to electricians prices.